One thing I have noticed since the demise of Google Reader is that some developers of news reader services seemed to have seem to have selected the features of their app or service via a random number generator. Butn the case of Rolio at least one feature appears to have been left out deliberately, and that turned this into a rather different service. Rolio isn't your typical news reader. In fact, it has no reader component at all, a detail which puts this service into another category. Rather than being a news reader, Rolio would best be described as a "river of updates" service in the likes of a Twitter or Facebook app. Instead of trawling your RSS feeds and serving up posts for you to read, Rolio merely offers a link much like what you would see on Twitter. 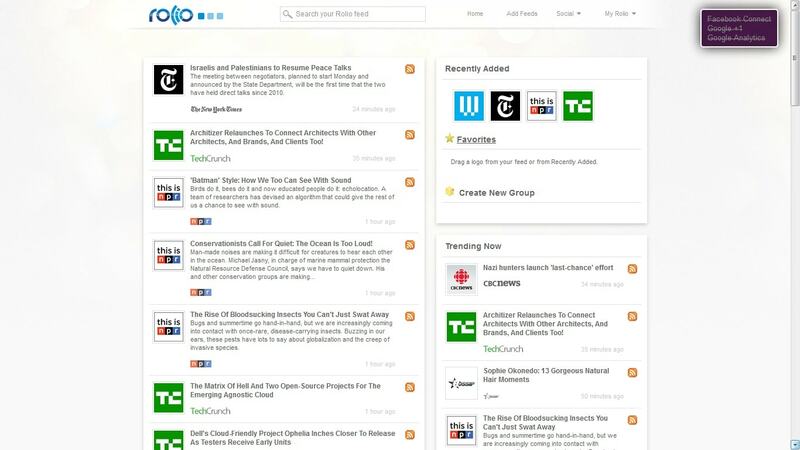 It can also serve up the latest updates from your Twitter or Facebook accounts, and you can tweet from Rolio. You can focus on a stream of updates from a single RSS feed by clicking on one of the icons at right (see the recently added panel), and you can also sort your feeds into groups. Unfortunately Rolio doesn't appear to respect the folder organization i created in Google Reader. It also won't let me import my full list of feeds. It is of course possible to subscribe to feeds or import your own OPML file (up to a limit), but I'm not sure that Rolio is really intended for anyone who follows a lot of RSS feeds. I think Rolio would be of greater use to anyone who gets their news via one of these social networks. 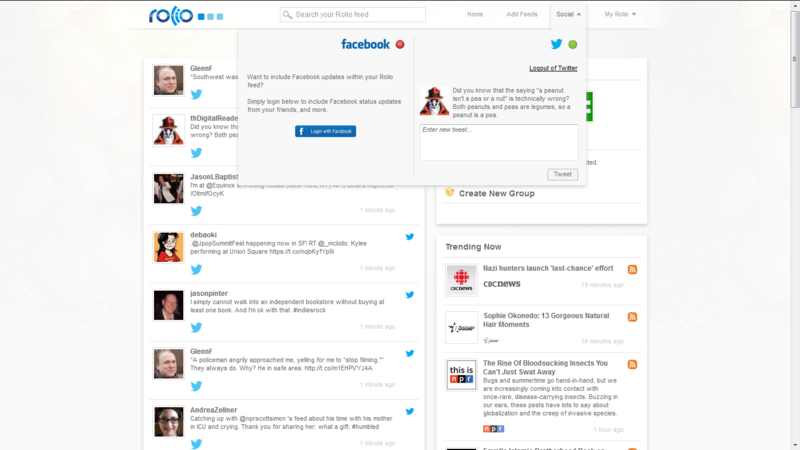 This service gives the more social reader a place to consolidate their Facebook and Twitter sources into a single clean stream. Rolio is currently free and available only in the web browser. Apps for Android, Windows 8, iPad, iPhone, and WIndows Phone are in the works. I for one never plan to use this service once I close the tab today. While I can see the utility, the fact that this is a stream of updates makes it completely useless to me. If I am using it as a news service then I need to know what I have missed while I was away. And frankly, Twitter isn't all that important to me as a news source, so I don't want the tweets getting in the way of links to news. Also, I found while using Rolio that the tweets tended to completely overwhelm the blog post notices. There's a volume problem here, and if I had added enough RSS feeds to balance out the many tweets the updates would be going past so quickly that I don't know that I would be able to catch them all. I have bought the basic Kindle Wi-Fi ebook reader recently. I want to know what is the best way of reading blogs/RSS feed using it. The experimental browser is difficult to handle, but I can set up a bookmark once. The issue is, I want a simple mobile version of reader in my Kindle. Do you know any that will help me, or do you think it’s better to stick to the computer for reading RSS feeds? Thanks for any help. I’m not sure how well it will work, though. The basic Kindle lacks a touchscreen and that will make it more difficult to use the news reader. Thanks for your reply Nate. In addition to the reader you have suggested, there are three more options that I am now looking at – KindleFeeder.com/Instapaper.com, Using Calibre to subscribe and send blogs to Kindle, SendtoReader.com. It seems, these services collect RSS feeds, convert them into one neat document and send it to Kindle (like once in a day) for easy reading. That’s something that I feel might be useful instead of having the Kindle browse a reader site in real-time. I will try them and update you if they were useful. Actually, it’s very difficult to read on the computer/laptop LCD monitor. So, I am trying to move some reading to eInk Kindle. I hope that will reduce my eye-strain. Thanks for your help, once again.